Update your basic capsule of stylish casuals for the winter. I’m getting to this a bit late ! but these are ‘transitional’ styles. In the current Personal Shopper section of the Eileen Fisher site, there’s a .pdf of styles for November to February 2011. This includes a “Cheat Sheet for getting dressed” with 12 items. A basic wardrobe of co-ordinates. Oh, absolutely everything is black, except the jeans which are dark indigo. Well, let’s ignore that. . . happily we can choose our own best colours. Making everything out of the same fabric would certainly simplify things 😀 but Eileen Fisher adds interest by using both wovens and knits, with a wide variety of surface textures and fibre types. Not much different from the skirts and pants in the Summer co-ordinates, which I’ve already talked about. Again similar to the tops I talked about in the summer. And two sleeved long tunics for more warmth. 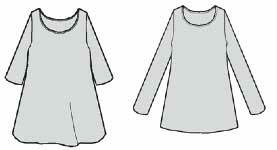 Flared and scoop necked, different amounts of flare and different length sleeves. A new pattern needed here. One problem with mimicking these is the flare shape. A simple solution is to lengthen and flare a favourite top pattern. But if you’d rather have the work done for you, there are some possibilities. Vogue 8542 has dropped shoulders. Easier to co-ordinate if you level the hem. Also for knits there’s raglan sleeved McCall’s 6205. Not so convenient for layering under a jacket. For an independent pattern, there are the striking Alex and Olive tops from The Sewing Workshop. They’ve chosen a flared long cardigan with neckline band. The text says it has a peplum, but that isn’t obvious from the drawing. A longer warmer version of one of the layers in the summer capsule. Which is the most flattering longer length for you ? at low hip, or thigh ? 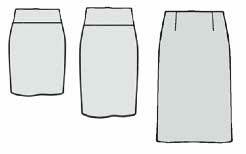 If you’re larger above the waist or the same size above and below, then the flared shape isn’t essential. 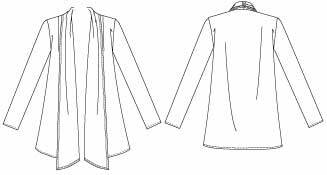 And it’s easy to find patterns for straight sided cardigan jackets. Just add length to a shorter style. 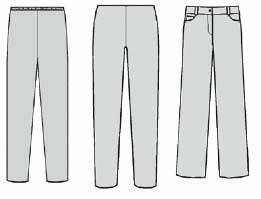 Those of us who are larger of hip may need to start from a straight pattern and flare the side seams. 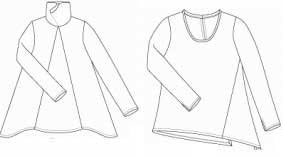 Also adjust the neck band to the right width and sewn down like the Eileen Fisher style, if need be and you prefer that look. There are several similar jackets in wardrobe patterns. Perhaps lengthen and flare the jacket pattern and alter the neck band. 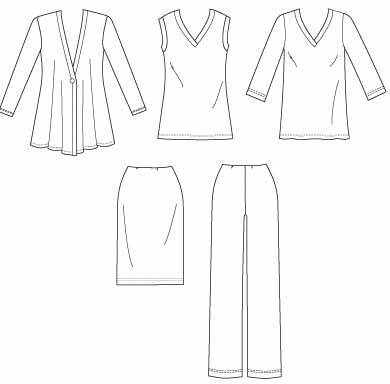 With small changes, these patterns could make a wardrobe quite like the Eileen Fisher one. Here are a couple for knits. Or of course choose your own jacket style. It just needs to be long enough and wide enough and with big enough armholes, to layer comfortably over those long sleeved tops. Perhaps the word ‘update’ is misleading. Although the specific patterns I’ve mentioned are recent, they’re current classics rather than trendy one-season-only designs. – platform sole shoes with -very- high heels. And of course I have a whole lot to say about the Eileen Fisher capsule as a whole, and how well it meets personal needs. This got much too long, so I’ve made that a separate post. And if you don’t like planning in detail ?! Just clarify the spirit of your capsule, as a guiding light that protects you from going too far astray. . . This entry was posted on January 15, 2011 at 11:44 am and is filed under co-ordinates, Eileen Fisher, wardrobe planning. You can subscribe via RSS 2.0 feed to this post's comments. Both comments and pings are currently closed. Wonderful post, sewingplum. Thank you!